How can our work improve the world? This core question is how we begin every Citizen HKS project. Citizen HKS – our firm’s public interest design and community service initiative — is grounded in the belief that all people deserve socially and economically healthy communities. We proactively seek impactful, empathic design solutions to the challenges facing marginalized and at-risk populations and the environment. That goal led us to Cass Community Social Services, a Detroit-based non-profit social services agency that provides food, housing, health services and job training programs across the city in areas of concentrated poverty. Most well known for their Tiny Homes Detroit program, CCSS is led by the enigmatic Rev. Faith Fowler. HKS first became involved with CCSS in 2016 through the firm’s Month of Service volunteer initiative, as well as my own participation in the Interfaith Rotating Shelter program that same year. After our initial volunteer effort, we immediately began brainstorming additional ways to engage with CCSS. From 2016 to 2018, our HKS Detroit staff volunteered countless hours toward CCSS endeavors, from designing a Tiny Home on their Dexter-Linwood campus, to volunteering in its Green Industries program and installing kitchens and painting apartments in CCSS’ permanent supportive housing. In 2017, HKS held the Midwest Design Fellowship in Midtown, using an under-utilized CCSS-owned parcel as a catalyst to rethink how its services could be housed in one mixed-use building. In late spring 2018, HKS began conversations with CCSS to expand our volunteer efforts into a larger Citizen HKS project. In a brainstorming session, HKS realized that CCSS owned a real estate portfolio with buildings spread across 11 different parcels in three different neighborhoods — but a comprehensive plan for improving and developing these properties had never taken place. In June 2018 HKS began the master plan; a three month process of visioning and alignment workshops with key CCSS leaders, conducting on-site interviews with program managers, visual surveys of properties and intensive rounds of research and analysis. Although HKS originally planned to develop architectural and design-centered initiatives, as is often the case with efforts like this, the realities of the client’s needs prioritized other less immediately tangible architectural solutions. Some of the design solutions in the resulting report included recommendations for aesthetic upgrades to improve resident outlooks, improvements to life safety and building envelope conditions, upgrades to achieve a more sustainable campus and reduced operational costs. 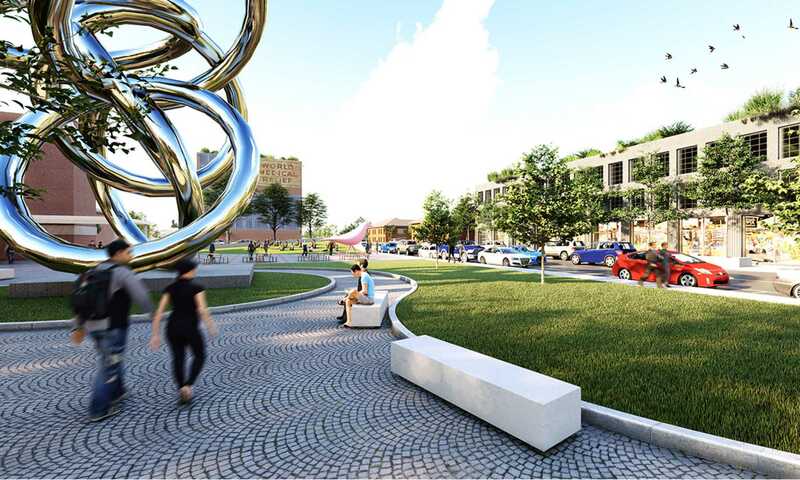 However, the more impactful solutions resulted from discovering impediments to neighborhood scale development, economic opportunity and urban design concerns. Because CCSS prepares and serves 700,000 meals annually to its residents and Detroit’s transient population, they inherently have a tremendous amount of organic waste. Because both HKS and CCSS promote sustainable practices, we researched ways to utilize or discard this waste in a regenerative way. HKS originally proposed on-site composting at the Scott building, located next to Elmhurst Park, where the main food hall and kitchen are located, and where some small scale urban farming occurs on CCSS’s campus. But due to odors and rodent concerns (the Scott building also houses the largest women and children’s day shelter), CCSS believed it would detract from the atmosphere of what they hoped would be a transformed park experience for these families. HKS researched alternative solutions and discovered Detroit Dirt, a local off-site composting service that would address both concerns. CCSS purchased the World Medical Relief building in 2015 — a massive eight-story industrial warehouse in Dexter-Linwood — to function as its headquarters. The building houses administrative offices, a food pantry, storage and assembly operations for its Green Industries program, but it was also purchased with the intent to convert several floors into affordable housing. Unfortunately, due to a low (non-existent) walk score, the neighborhood does not qualify for LIHTC (low-income housing tax credits), so they shifted the focus on affordable housing to other properties. The walk score issue also affects other properties owned in Dexter-Linwood, and therefore the ability for other affordable housing developers to invest in the neighborhood. So our researchers uncovered the original walk score algorithm and the characteristics that were defined within it. As it turned out, what was required would take on larger urban design and neighborhood level implementation, combined with small scale insertions that CCSS could take on itself, like adding a small neighborhood grocer, a coffee shop, a retail store. Lastly, when queried about the one service line CCSS would like to increase or improve, the alignment and decision was clear: job training. Rev. Fowler was emphatic and passionate about the main issue facing the population CCSS serves — creating adequate and appropriate jobs in the neighborhood would provide residents with stability. So HKS researched the proximity of larger scale businesses to the neighborhood and quickly discovered that none were within walking distance. This was clearly not an issue of available land, as there are many contiguous vacant parcels; nor was it necessarily a lack of desire for the location. The issue was one of zoning and land use. HKS’s research determined that parcels zoned for light industrial manufacturing or service jobs were virtually non-existent. 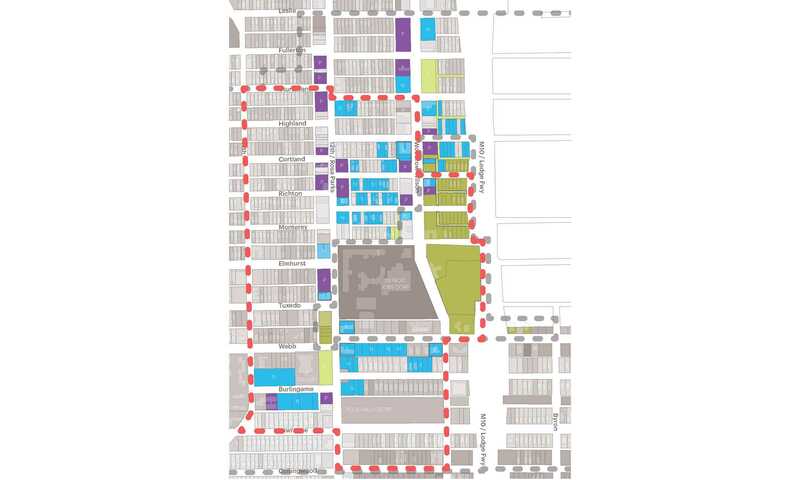 With an analysis of alternative zoning district regulations that would maintain a vibrant mixed-use district and a neighborhood scale, overlayed with commercial corridor vacant parcel data, HKS created a series of recommendations for targeted parcel rezoning along stretches of Rosa Parks Boulevard and Woodrow Wilson. 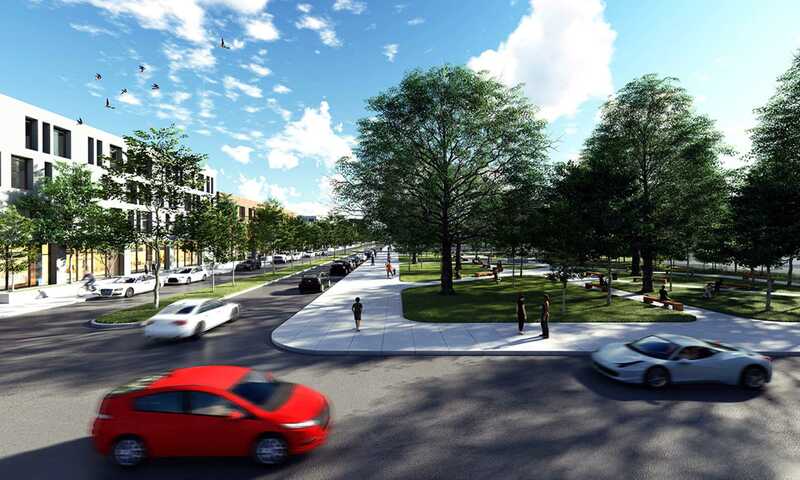 The recommendations would allow for the type of uses, at the right scale, that would catalyze business opportunities within a new walkable neighborhood. While CCSS has started implementing small features of the master plan, HKS has also engaged the City of Detroit for feedback and assistance through programs such as Motor City Match. We hope that our research can be a catalyst to inform future decisions affecting the Dexter-Linwood neighborhood, such as land use, parking, alternative transportation and open space that will improve the health and well-being of area residents, economic opportunity and walkability. HKS Detroit has been energized since our first encounter with Cass Community Social Services and Rev. Fowler, and we believe our master planning effort is just the first step in a lengthy partnership. Alex spent over 15 years in New York, designing award-winning, large scale mixed-use residential, hospitality and commercial projects around the globe. Born, raised and educated in Michigan, Alex returned in 2016 to participate in the exploding architectural growth of the region.